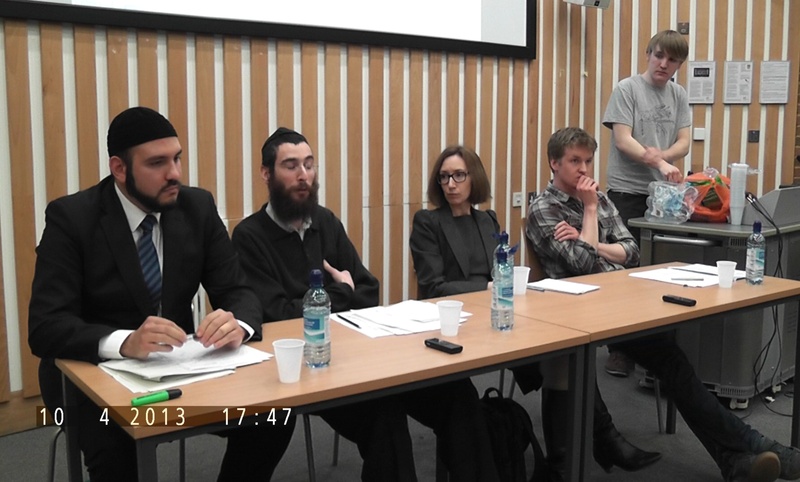 Yesterday for my human rights/Liberalism panel debate, I was joined on the panel by Rabbi Zalman Lewis of Brighton Synagogue, Dr. Elizabeth Craig, a university lecturer on Human Rights, and Shane Horwell, president of the Sussex Humanists, and member of the National Federation of Atheist, Humanist and Secular Student Societies. The discussion was meant to be how the current human rights interpretations of european governments and the European court of human rights, could be re-tweeked to better prevent a clash between people’s religious rights against secularism. I demonstrated that this clash is natural due to the fundamentally secular, non-neutral and therefore intolerant, nature of Liberalism (the ideology that posits the list of its views of what human entitlements should be – called popularly: ‘Human Rights’). I managed to show how Liberalism is intolerant of other ways of life (especially religions that refuse to neuter themselves of their own legal traditions). Liberalism’s tolerance is merely the delayed onset of its intolerance. Any toleration that does exist, is temporary until a dissenting group is perceived as persistent or significant enough to ban, outlaw or employ social reprobation against. To demonstrate that, I cited a number of cases of the banning of Islamic non-violent groups, and Islamic clothing, which the european court of human rights AGREED with and upheld. What happened next surprised me, the audience (of highly intelligent, and virtually exclusively non-Muslim law students), started to agree! And some asked me what they should do, to which I responded that they should go back and have a serious think about the viability and soundness of continuing to implement Liberalism. Knowing that I was Muslim, I was asked about sharia, capital punishment, and the Islamic model of Caliphate. I was then able to robustly defend the Islamic model for human society, demonstrating a clear and sound intellectual basis for its understanding humans, not as absolute individuals, but as social creatures, who require a holistic and rational system, based upon solid values and methods (from revelation). Both the audience and the panellists were very intelligent and sharp in their thinking. They asked many questions to me, and tried their very best to find any holes in my arguments – which I loved so much about this debate! I think this debate can truly be said to be my first debate specifically and exclusively about Liberalism. I ended up deploying a whole number of my observations and thoughts about it – and it was gratefully received! I will get MDI to make a transcript of this debate, for truly all the facts and observations made were enough to intellectual demolish the idea from so many different angles. The audience, who were initially sceptical about my position (mainly because they have never really heard the dogmas of Liberalism actually be challenged before), soon came round to my arguments, and were asking me for advise about what to do about it. All in all, a great debate alhamdulillah. May it be a great help to anyone trying to learn more about how to refute Liberalism, and defend the Sharia, intellectually. Ameen. The video will be available soon, and the transcript will be published shortly afterwards Inshallah. To watch the trailer, please click here. ‹ Q/A: How can the world go back to the Gold standard for money? You say you’ll get a transcript done – does that mean there will or won’t be a recording available? 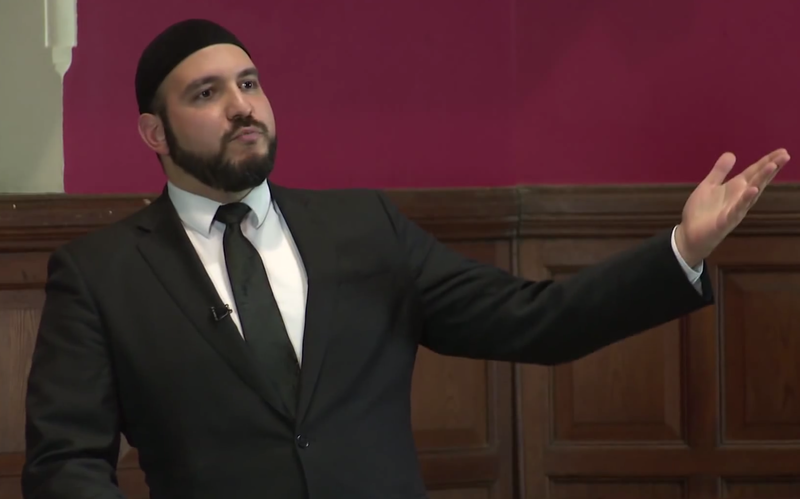 It sounds like it was an absolutely brilliant debate – hope to hear it insha’Allah! I wanted MDI to produce a transcript, because the debate was filled with great arguments, questions and points, that people may want to refer back to. So for the sake of providing a helpful reference for people, I have requested a transcript be produced. However, the video of the debate will be available on the weekend Inshallah. Ah mais c’est vrai! J’oublie toujours que tu parles aussi le Français (e o português, não?). Bon, jazakAllahu khayran, j’attends le vidéo avec plaisir incha’Allah. D’ailleurs, je t’ai envoyé un message sur Facebook il y a quelques minutes, si t’as un moment pour lire, c’est peut-etre rendu dans les “Autres” messages au lieu de l’inbox. Merci encore!